The Philishave shaver was invented by Philips engineer Alexandre Horowitz, who used rotating cutters instead of the reciprocating cutters that had been used in previous electric shavers, and was introduced in 1939. This promotional deck of playing cards was commissioned by Philips to promote the black Philishave model with three heads in 1978. The suit symbols are the parts of the razor. The result may not be very attractive, but it is original. Above: naipe español for PHILIPS with non-standard suits and courts advertising electric razors. 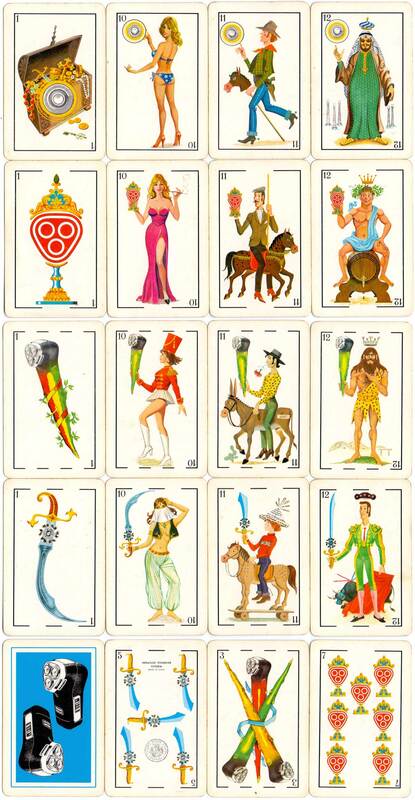 40 cards in box, manufactured by Heráclio Fournier S.A., 1978.